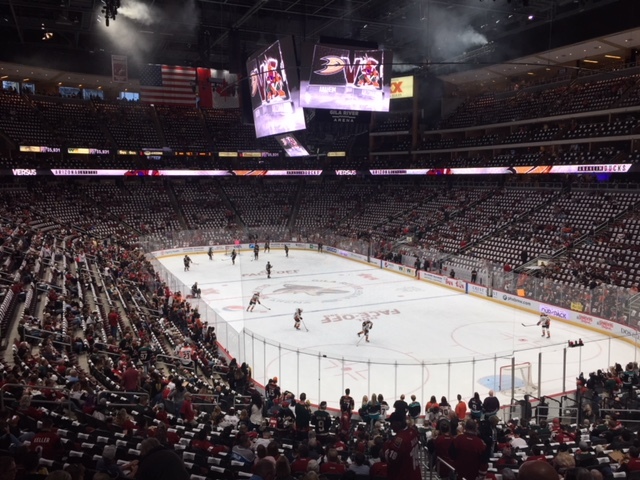 The Arizona Coyotes don’t sell out many games, but Saturday night at Gila River Arena was one exception. Though they could not come up with even a goal, the Coyotes still have a chance to be better than last season’s team. They haven’t played badly in their first two games of the NHL season, but have zero goals to show for their effort in two losses. Saturday’s was 1-0 to the Anaheim Ducks. There’s a belief shared by more than a few that this Coyotes team, which hasn’t been to the postseason since the 2011-2012 season, can make run to the playoffs in 2018-19. There was a buzz in the building that this team could truly be better than those of the previous few years. But that remains to be seen. But for one night, the arena was filled with Coyotes fans and not those of the visiting team, and a sellout was announced. The late Sen. John McCain was honored, legend Jeremy Roenick dropped the first puck and the fans were there, even if a Monster Jam show was jamming up traffic and parking across the street.